Leeds United's Elland Road ground. 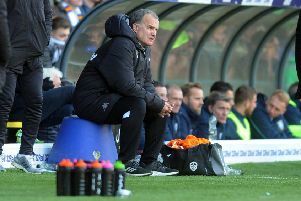 The Football League has confirmed that Leeds United will not be able to sign any players for the rest of the season after failing to meet the new Financial Fair Play guidelines. United, along with fellow Sky Bet Championship outfits Blackburn Rovers and Nottingham Forest, have been placed under a transfer embargo. A statement from the Football League read: “An initial analysis of Financial Fair Play submissions from the current 24 Championship clubs has indicated that three clubs – Blackburn Rovers, Leeds United and Nottingham Forest – have failed to meet the Fair Play Requirement under the division’s Financial Fair Play rules. “Consequently, all three will be subject to an ‘FFP embargo’ under Football League regulations from January 1, 2015 for the remainder of the current campaign. “The Football League is currently in discussions with a number of other clubs over their FFP submissions and will confirm any further FFP embargoes, if any, in due course. It will also now consider submissions from the three clubs promoted to the Premier League and the three clubs relegated to League 1 at the end of the 2013/14 season. “Blackburn, Leeds and Forest all exceeded the maximum permitted deviation of £8m - consisting of a maximum adjusted operating loss of £3m plus a further maximum of £5m of shareholder investment - during the 2013/14 playing season. The statement continues: “Football League has also confirmed the way in which FFP embargoes will operate for clubs placed under this sanction. “Clubs will be prohibited from registering any new professional players (permanent contract or loan) unless they have: 24 or fewer established players (players aged 21 or over that have made at least 5 starting appearances for the club). “Where clubs have fewer than 24 established players, they will only be permitted to sign players in the following circumstances (with the player in question being added to the club’s list of established players regardless of his age or previous playing experience): Where the employee costs of a player being signed are less than £600,000 per annum (or pro-rata if signed on a shorter contract). “Where clubs have 24 established players, they will be permitted to trade on a ‘one out, one in’ basis but only if the employee costs of the player coming in to the club are no more than whichever is the lower amount of: 75% of the equivalent costs of the player going out, or a maximum of £600,000 per annum (or pro-rata if signed on shorter contract). “In addition: Clubs under an FFP embargo will be permitted to sign a goalkeeper on an emergency basis (in line with existing regulations). “Clubs under an FFP embargo will not be permitted to pay transfer fees or compensation fees for professional players. “Clubs under an FFP embargo will not be permitted to pay a loan fee to another club, they may only pay the player’s wage (or a contribution towards it).